Legend has it that the 'gentlefolk' of Königsberg would spend their Sunday afternoons walking around the town. It is believed they were attempting to cross each of the seven bridges, that join the north and south of the river to the two islands, once and once only without retracing their steps. 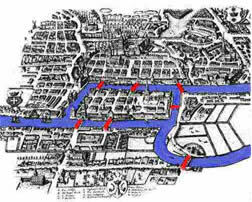 Can you succeed where the people of Königsberg failed, and solve the problem of the seven bridges? If not, can you explain why not? If you can, explain how you know that you have all the solutions? Visualising. Creating and manipulating expressions and formulae. Mathematical reasoning & proof. Cubes & cuboids. Topology. Generalising. Mathematical modelling. Working systematically. Interactivities. Networks/Graph Theory.